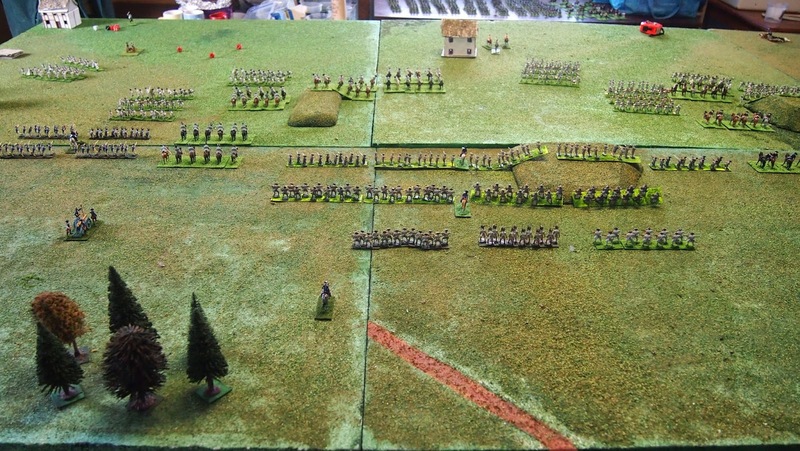 Amongst our recent games during this brief 'sojourn' from Napoleonics was a game in my favourite period using a set of rules that I have had my eye on since they first came out in 1992 (but never got round to buying until the ANF spurred me on). Now we have the second edition (1998). I always thought that Age of Reason, by Tod Kershner and Dale Wood would be the right set of rules for the Marlborough period, but I knew nothing about them, the only rule set I had used prior to this game was Age of Marlborough - which is an 'old style' set that the ANF used for its very first battle way back in 2010 and which did absolutely nothing to persuade James and Mark to repeat the experience. I was of course hoping (praying!) that they would feel differently about Age of Reason. James said that he'd expected expected some kind of 'Empire for the Lace Wars' but was happy to admit that he had been wrong - he said afterwards that 'The rules have nothing of the Empire mechanics, but capture the flavour and peculiarities of the early 18th century perfectly'. I and Mark read the rules beforehand, but James found that even though he hadn't read the rules, he was able to look up the tables easily for each test. 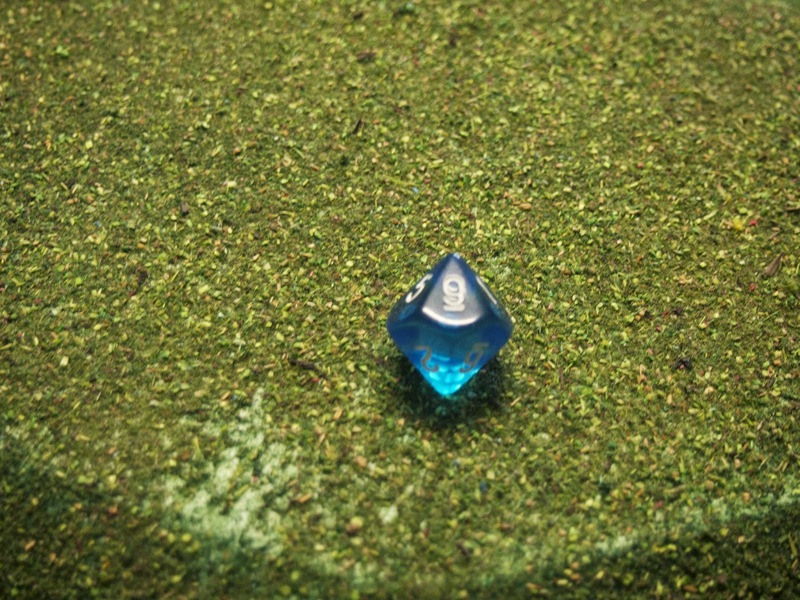 I agree completely that the rules are easily picked up and have excellent mechanics. What I hadn't realised was that they were written primarily for mid-18thC wargames, however - and it may just be that in the fullness of time the ANF make a few modifications (there are some suggestions on line already, in fact, which we will review). One big issue is undoubtedly the way in which units continue to survive on the battlefield despite very large percentage losses. 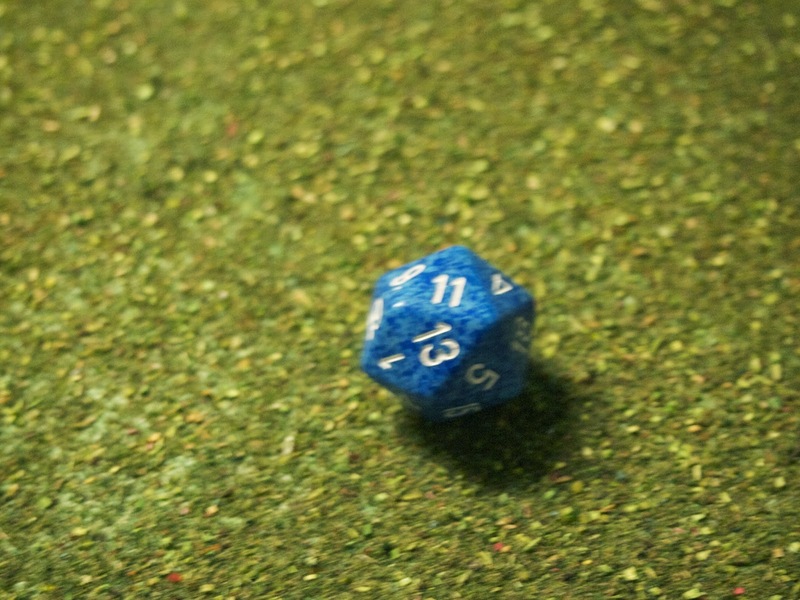 This is connected with the small (12 figure) battalion size, although this is extremely useful for generating large armies. 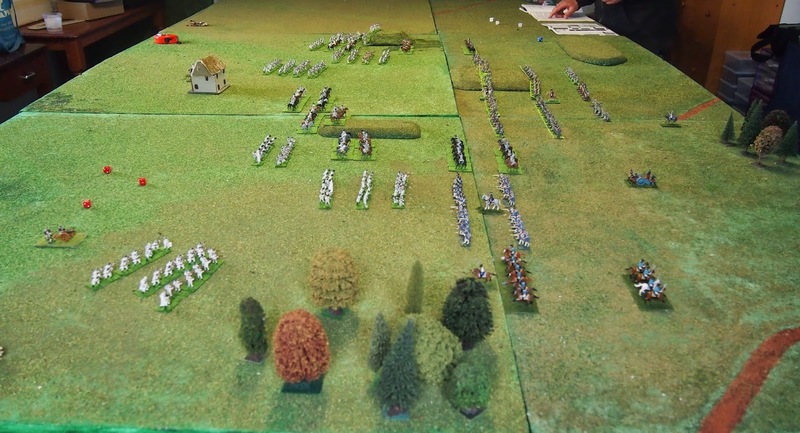 For our first game using Age of Reason, we fielded all of the figures from my old War of Spanish Succession armies that I'd got into a state fit enough to be on the table. This gave us an array of predominantly Airfix Washington's Army figures painted as Austrians and French, with a few Bavarians from both mine and Mark's Seven Year's War collection (again either Washington's Army or conversions using their heads). 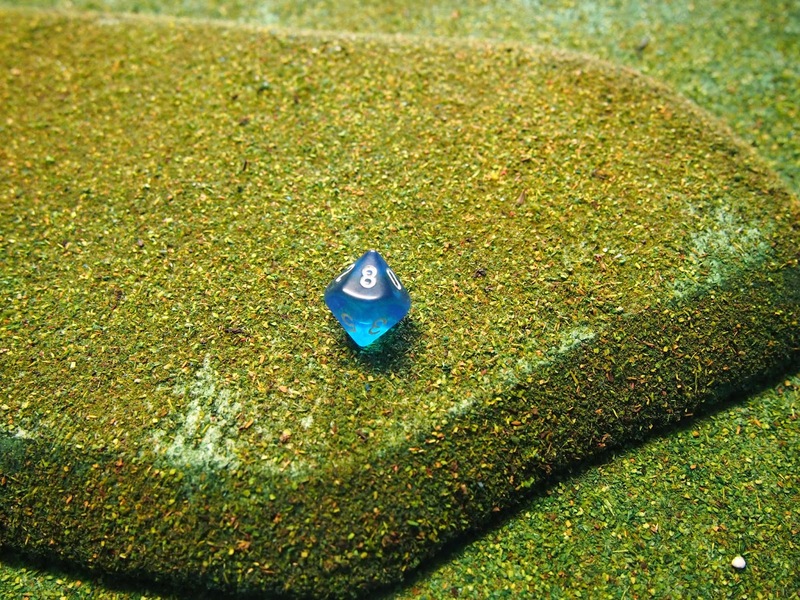 As you may imagine I have a strong affinity for that set - many years ago there was simply no alternative for plastic WSS wargaming - and there still isn't, more's the pity. 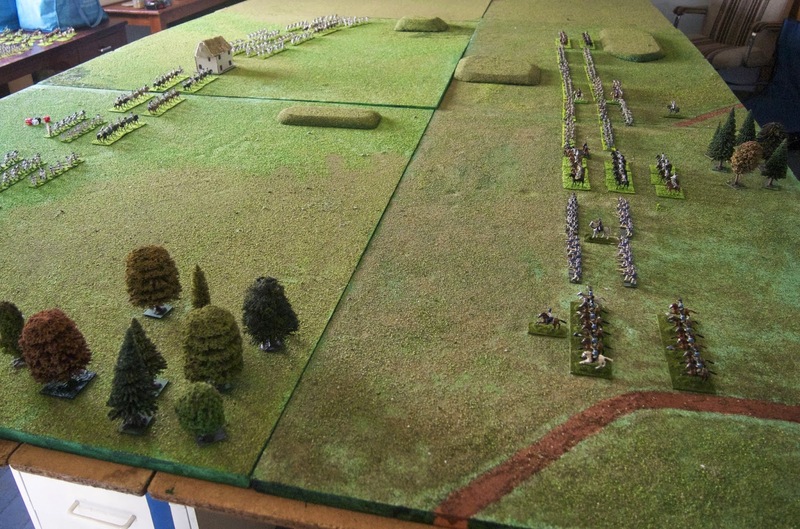 Here is the initial set-up, a typical WSS battle with the two sides lined up facing one another. 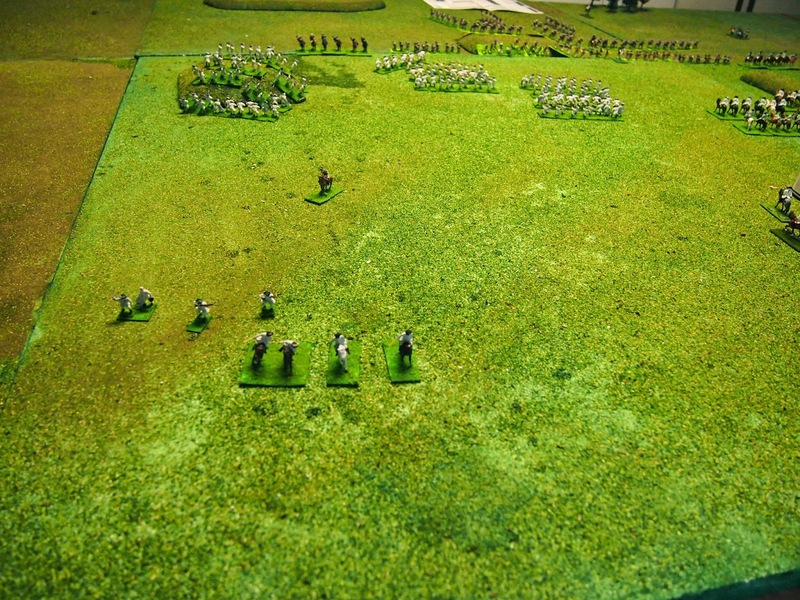 We fielded a small to medium sized army with 12 French battalions (including three Bavarian line and one Bavarian and one French Grenadier) and 17 Austrian (including two Grenadier). 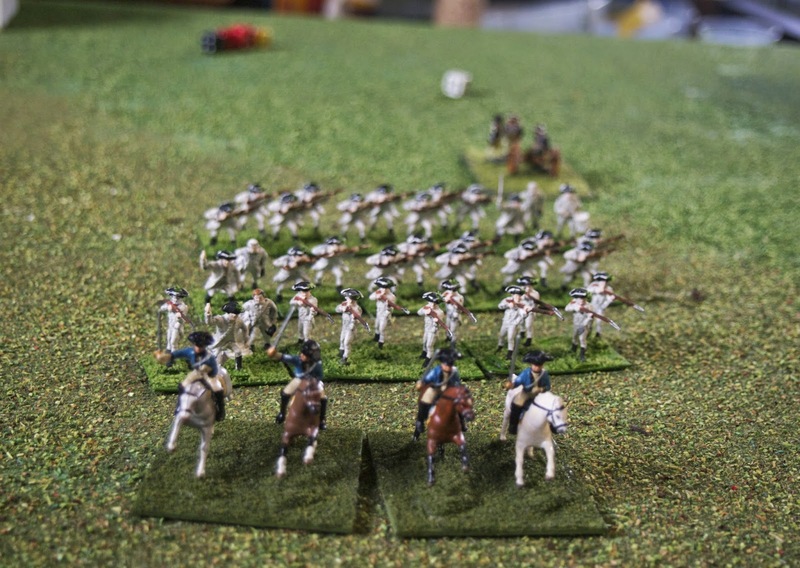 The cavalry, French and Austrians, were equal with 7 squadrons apiece. We gave both sides a medium gun. 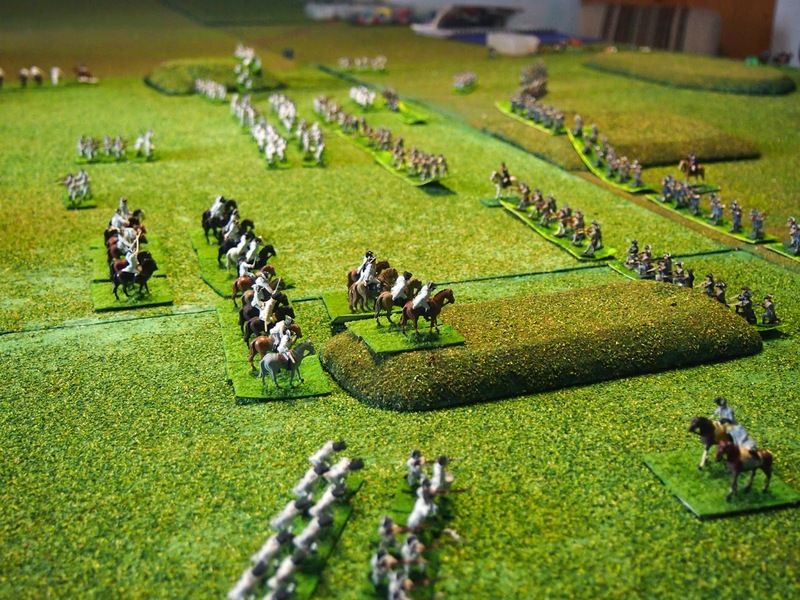 In game terms this represented a force of 9,000+ on the French and 12,000+ on the Imperial side. This is a view from the Imperial right flank, an imposing force. The Imperial divisions were organised in 'line astern. 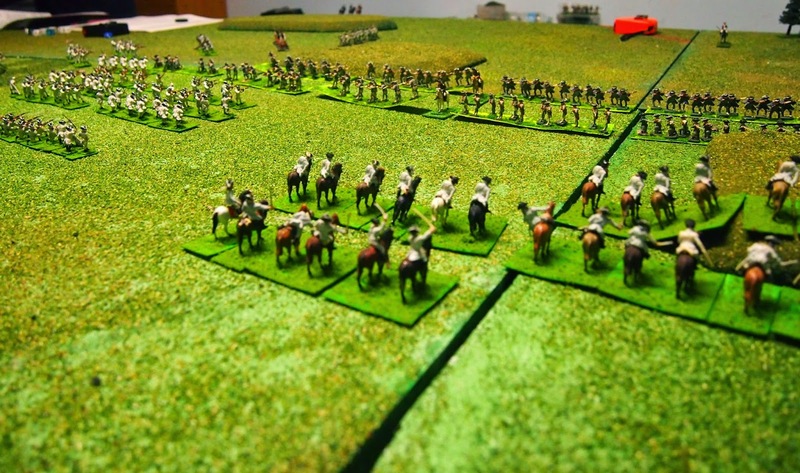 As Imperial commander my plan was simple enough - I intended to try to get the French to waste their cavalry, whilst using mine to hold back a significant portion of his infantry, enabling my infantry to advance and gain tactical superiority in the firefight. My centre would therefore hang back whilst I advanced on both flanks. 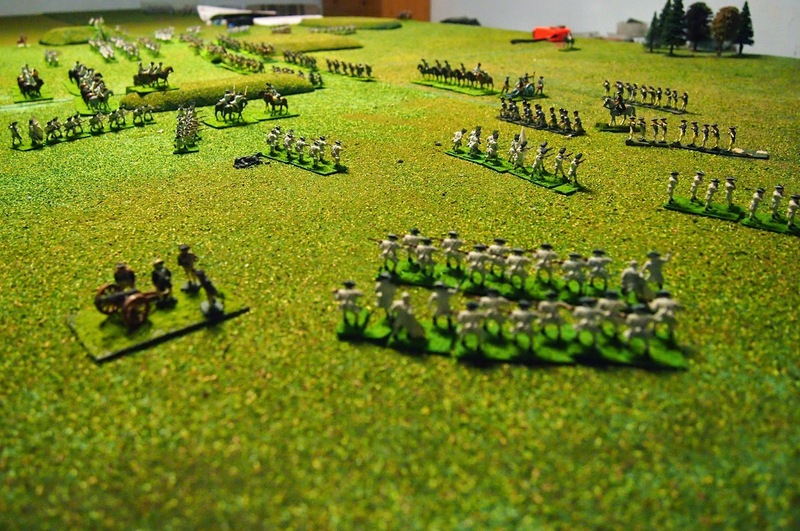 Here is a view of the Imperial left flank with the problematic hill in front of me and the battalions advancing three deep, except for the cavalry brigade 'embedded' with the left flank. It was with this force that I hoped to overwhelm what looked like quite a fragile French line. Turn one, and Age of Reason was finally 'live' after a wait of a mere 22 years. 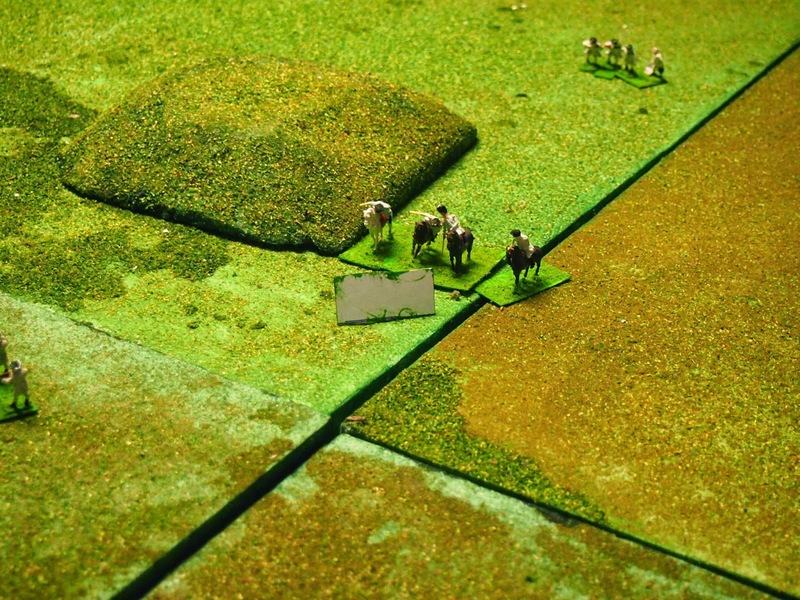 It was already a joy to discover that my ANF colleagues were happy to fight 18thC wargames - willing wargamers of the period are few and far between! 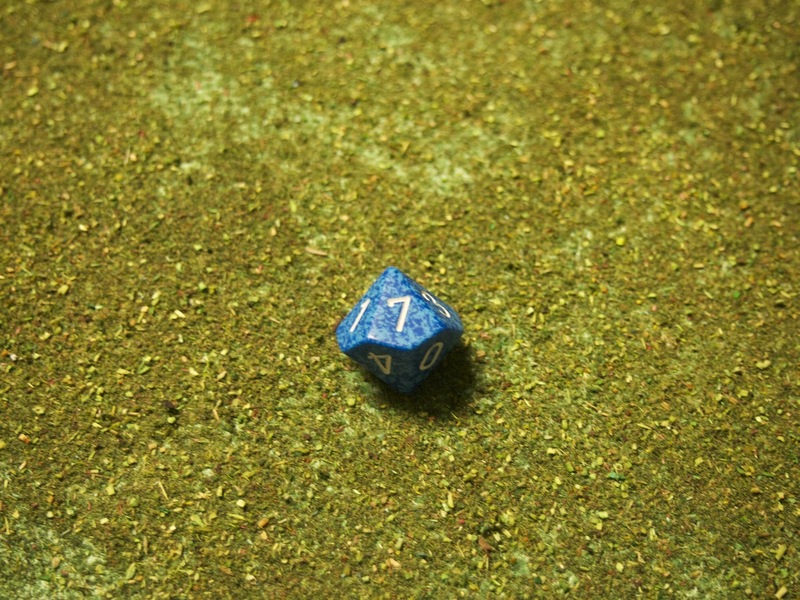 But would the rules live up to the hype that I had generated? Initially both forces moved forward - quite a surprise for the French and Bavarians to do so. Their second and third lines were hung back. This seemed quite mysterious to me. 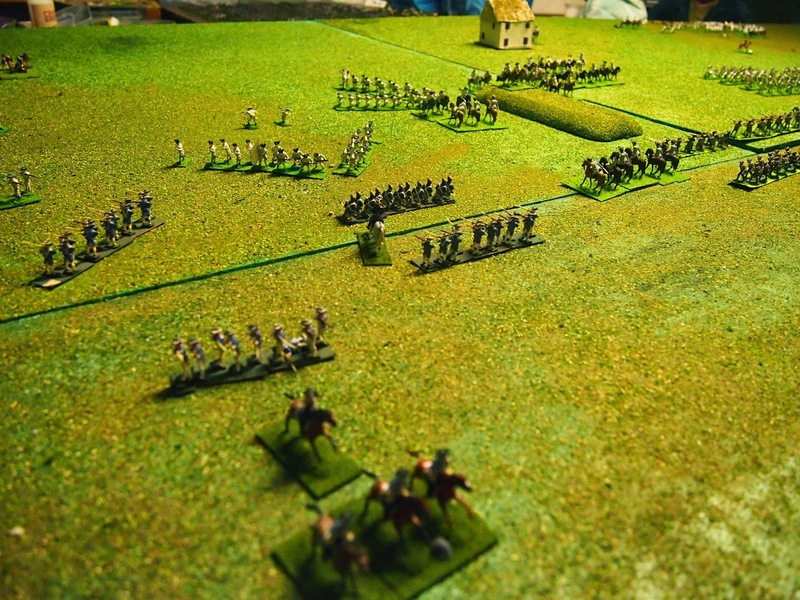 I wanted to be able to deploy a first line, shoot up the French, take some casualties, and then march off, leaving my second and third lines to take over the struggle. But would the rules allow this? 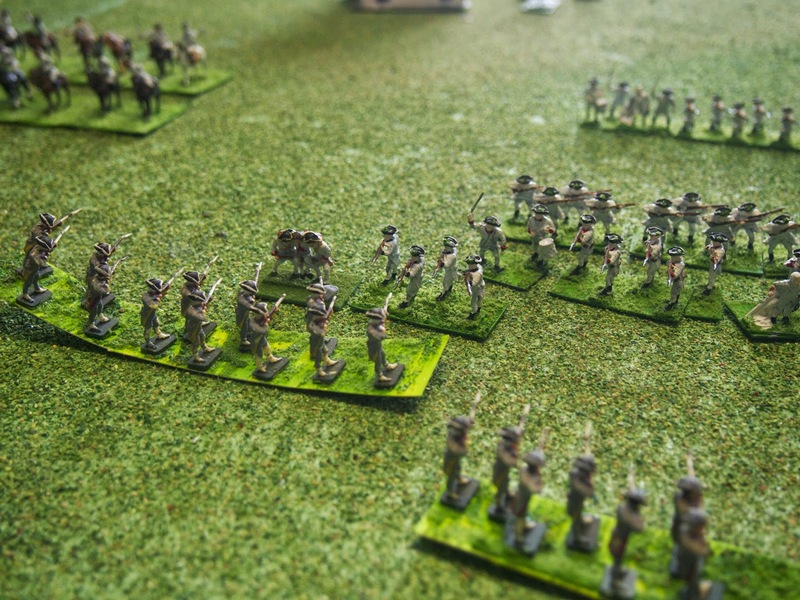 A close-up shot of Mark's Bavarian cavalry, driven off by Austrian infantry in line. 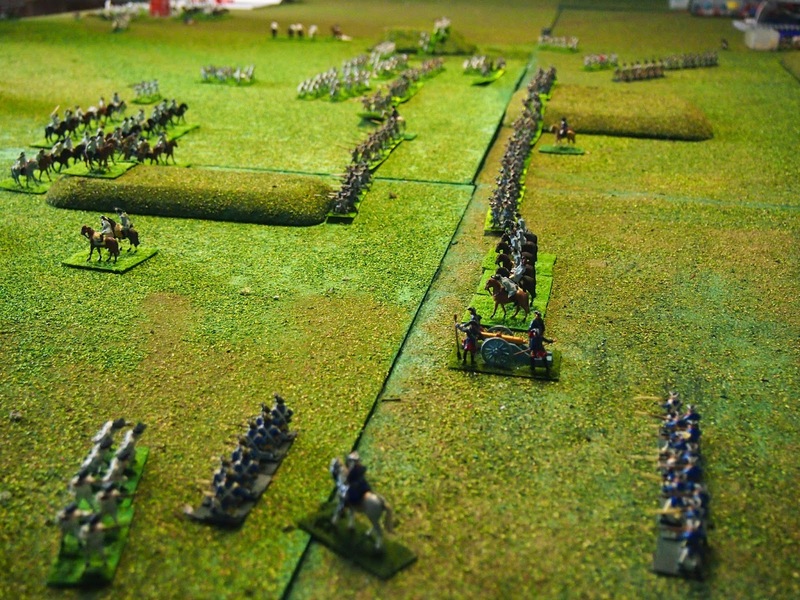 The enemy was realising with a shock how ineffective cavalry can be in early 18thC battles! An overall view from the French side after the second move. 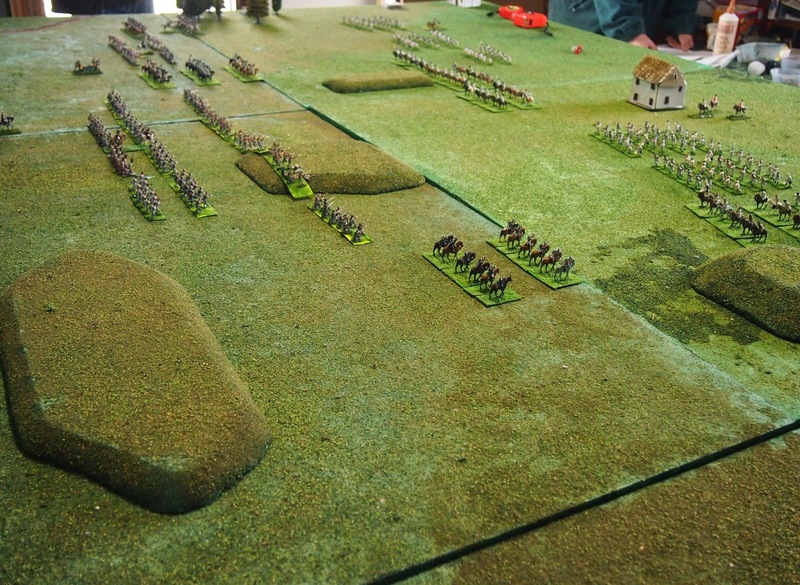 Already you can see the Allied cavalry hanging back whilst the French force remains virtually in line. The aggressive right flank French cavalry are about to be engaged, whilst the Bavarian cavalry on the French left looked dangerously exposed to me, with the first squadron already beaten back and in retreat as a result, a good result for the Allies. 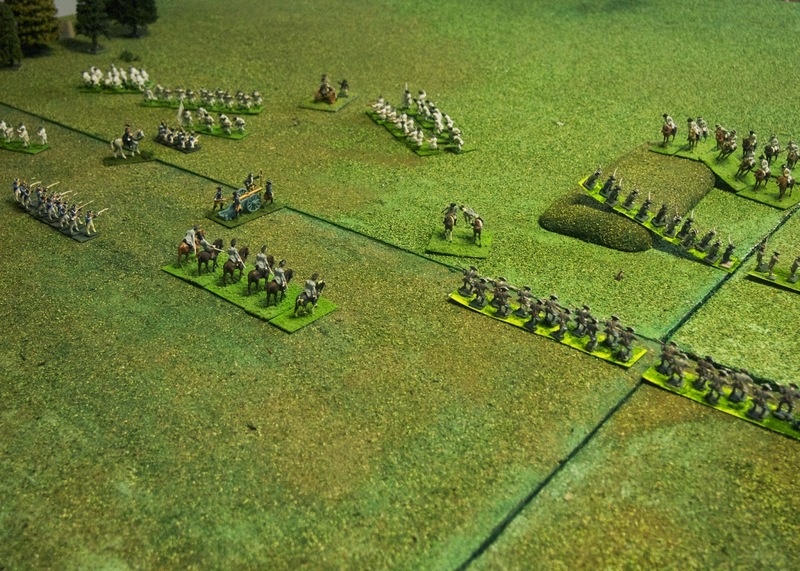 In retrospect, the gap between my divisions on the right does seem an excessive risk, but at the time it just seemed necessary to provoke the French commander into wasting his cavalry, or so I hoped - as the second shot below shows. Turn three and the action was really getting under way. 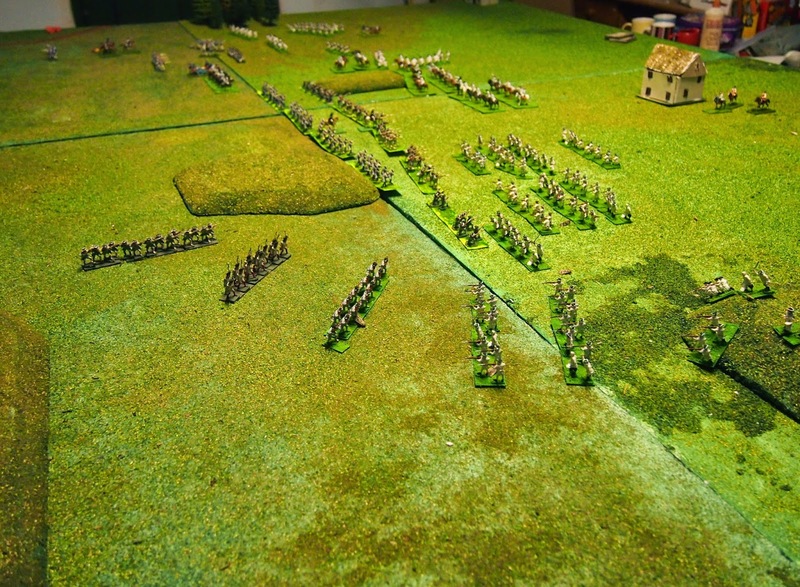 On the Austrian left, visible below at the right of the picture, firing had commenced, whilst on the left, the French were indeed attacking with their cavalry - the plan appeared to be working! A beautiful view by James from my command post at the village. You can see that the hill on my extreme left was finally being crossed, whilst in the centre the brigades were coming into action. 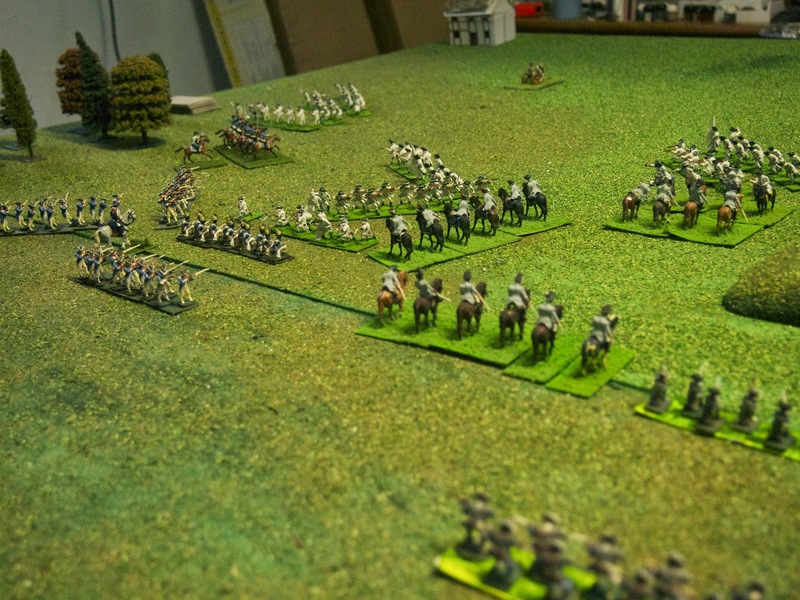 What was to prove a long and exacting cavalry melee had begun between two very determined squadrons (on the right of the photo). 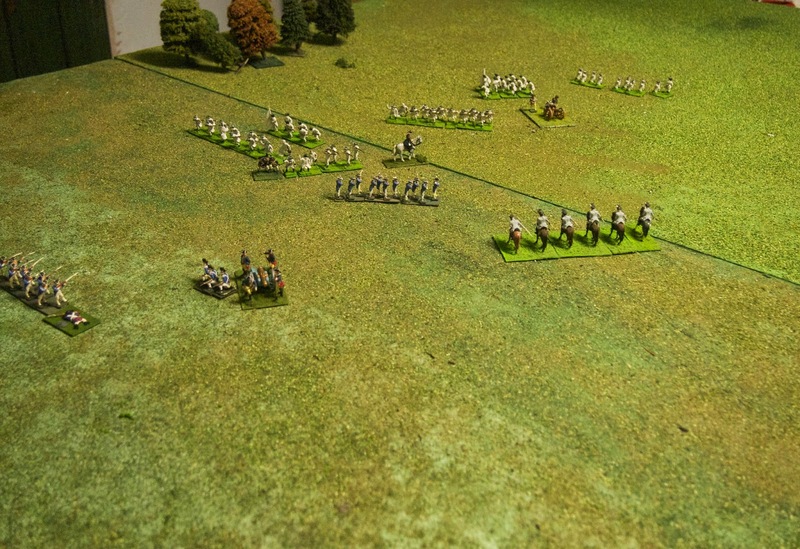 Another squadron of French cavalry was about to receive volley fire at short range (extreme right). 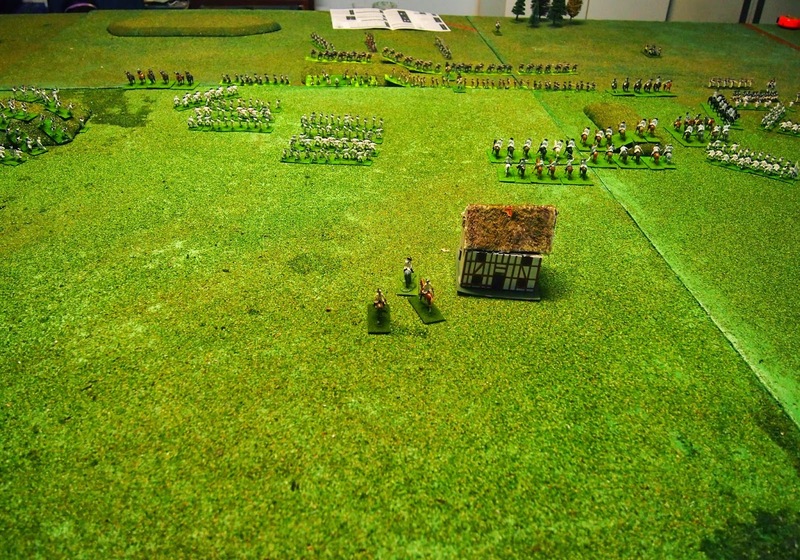 Here you can see the same event from the Bavarian commander's vantage point. 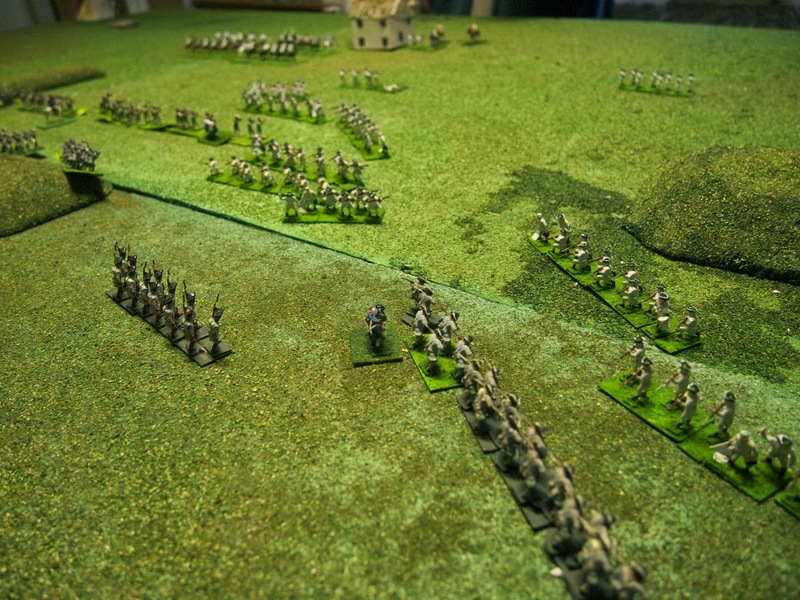 The Bavarian grenadiers were engaged in a firefight already; most satifyingly from my point of view as the Allied commander, the Bavarian and French cavalry found themselves in frontal view of my left flank of infantry. 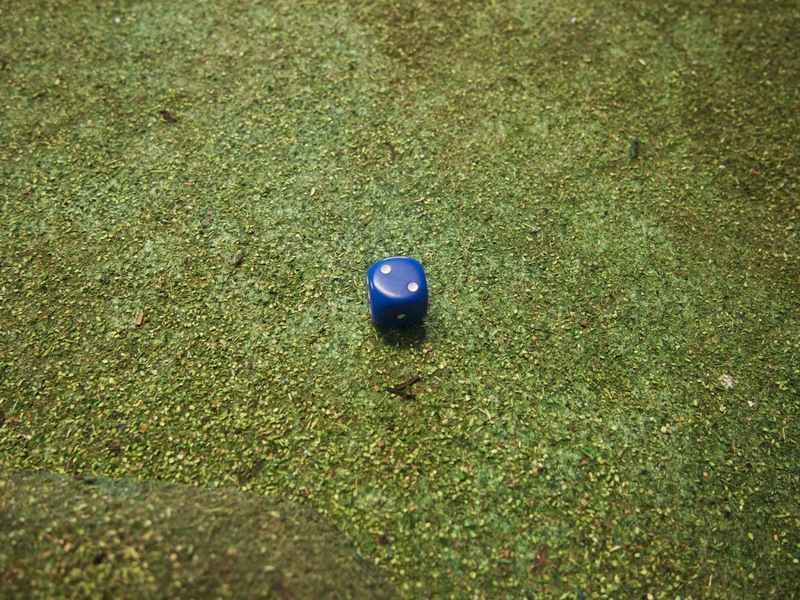 The rules mechanics already appeared to be working well - three hours into the action and we were starting to see casualties and deployments. The same could not be said for the Allied left flank, where the superiority of the French cavalry had told, with an infantry battalion broken and a squadron of Allied cavalry in headlong retreat. This made taking the hill, which I had 'taken' for granted, a much slower and tougher proposition. This shows an overall view of the battle at the end of move 3, taken from the Allied right wing. 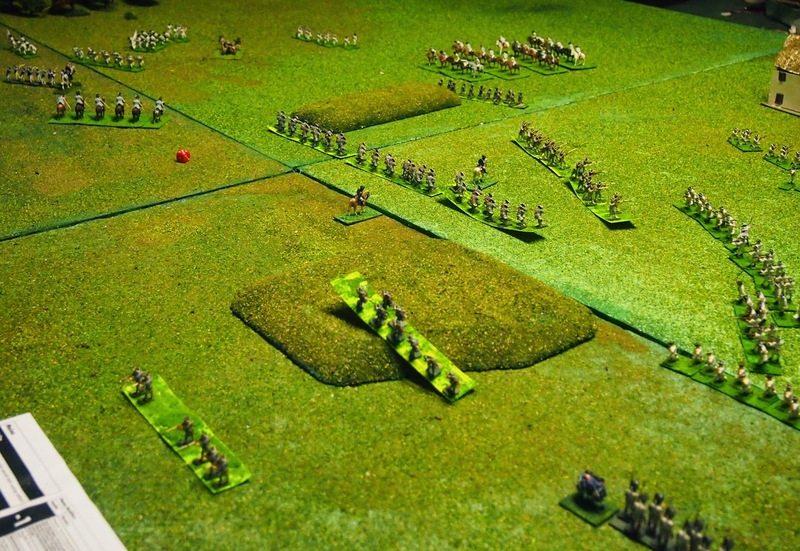 Despite the relatively modest number of troops involved, and the fact that we did not use the entire game board available to us, the distance between the wings of the armies was really considerable and there was not the slightest chance that brigades could swing round and involve themselves on the other side of the table. This seemed entirely realistic. 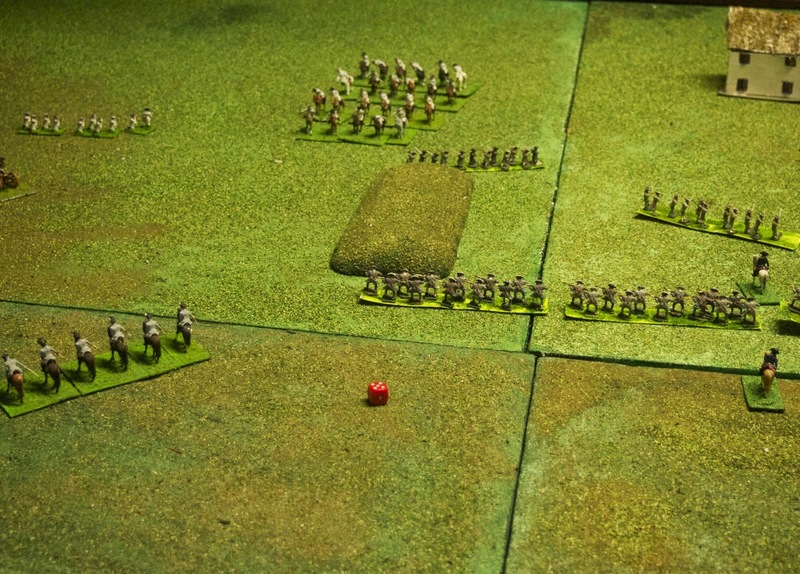 Move 4 and the French commander finally decided to alter the trajectory of his reserves, thinning the line and sending the grenadiers and the other reserve battalion to his beleaguered right flank. In the view below you can clearly see them peeling off to do their duty. To their front, just one French battalion now faced a series of Austrian units, with one wheeling to expose more firing from behind. 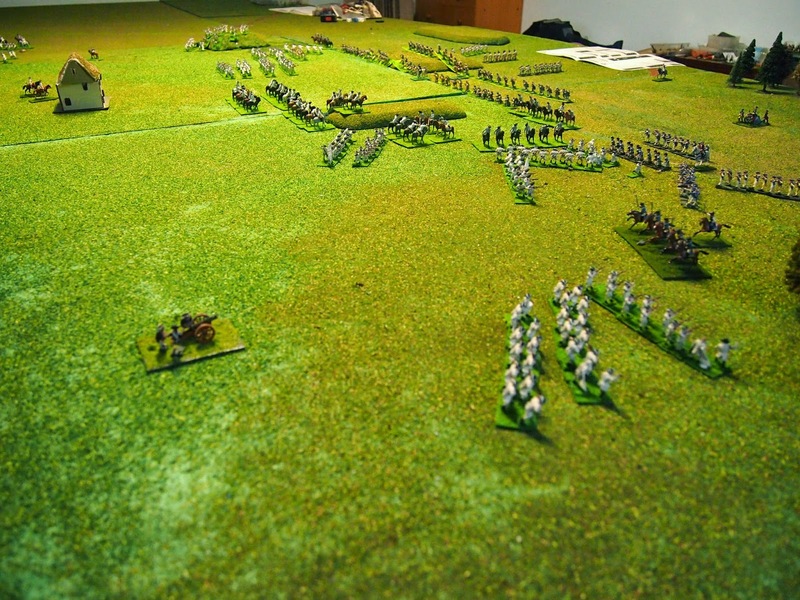 In the foreground you can see the French guard cavalry retreating after their melee. 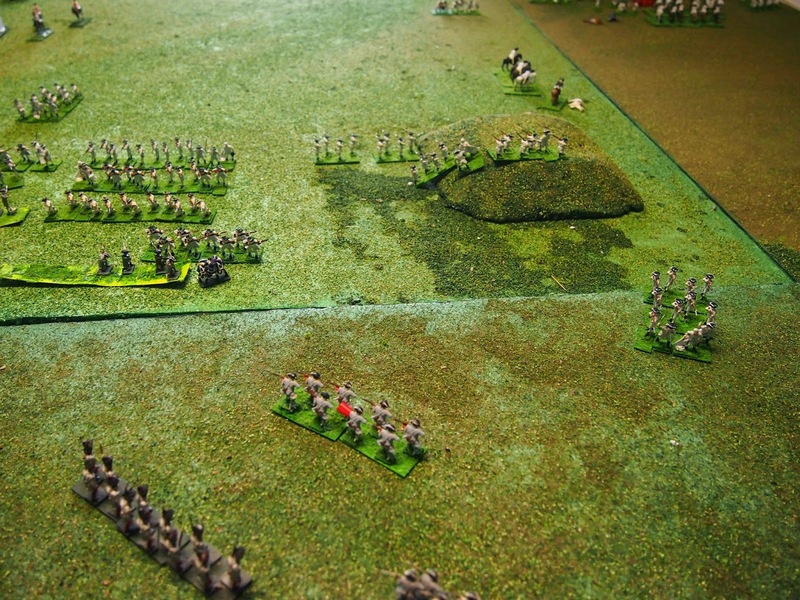 More bad news for the Bavarian commander - the grenadiers retreated after suffering heavy casualties, and the cavalry also. 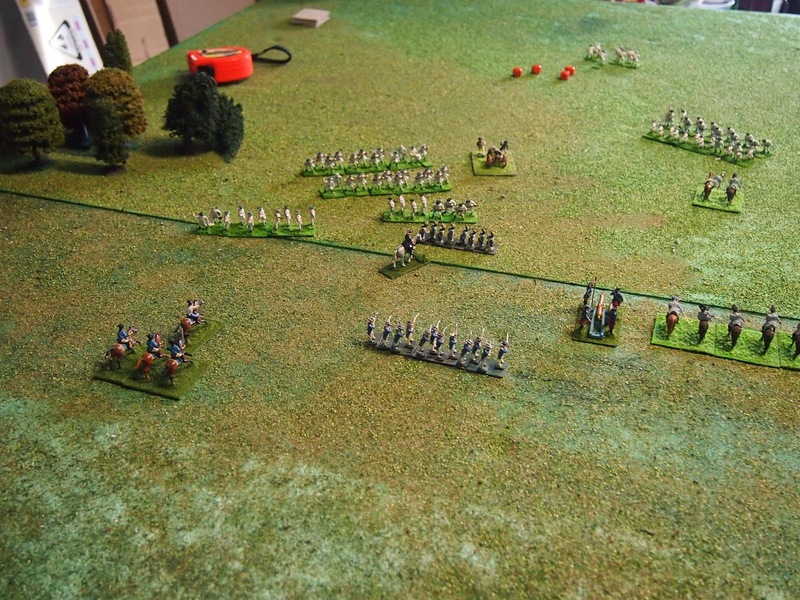 The left flank was looking shaky for the Ancien Regime forces. A beautiful view right down the line - the way these shots ought to be taken, in my opinion. Look closely at this and you can see the gallant Bavarian commander in the centre view rallying his depleted forces, with one battalion rather exposed. The two Austrian battalions in the bottom left of the view are struggling to catch up. The Bavarian artillery is largely masked, as it had been all battle. 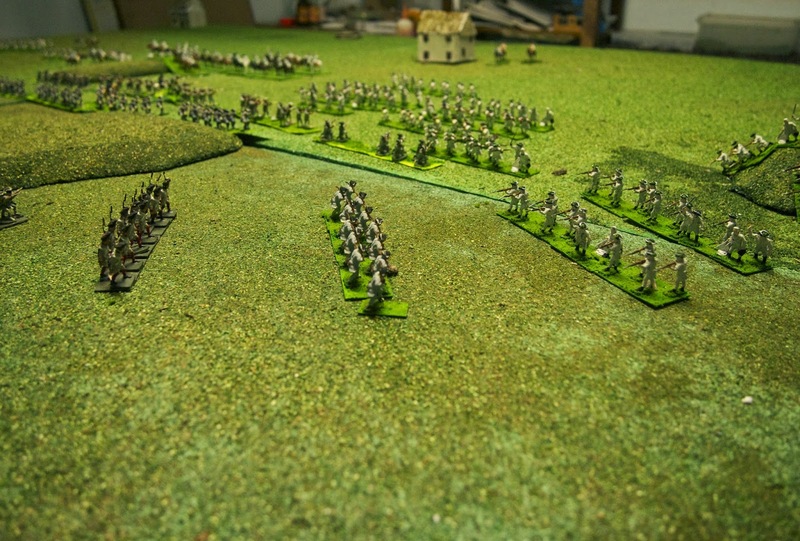 Nothing is happening in the centre where the French infantry line remains unbroken, whilst in the distance you can see the Austrian infantry deploying against the right of the French line. The next turn, viewed from the French side, with their reinforcements advancing to prevent an encirclement of the main line. 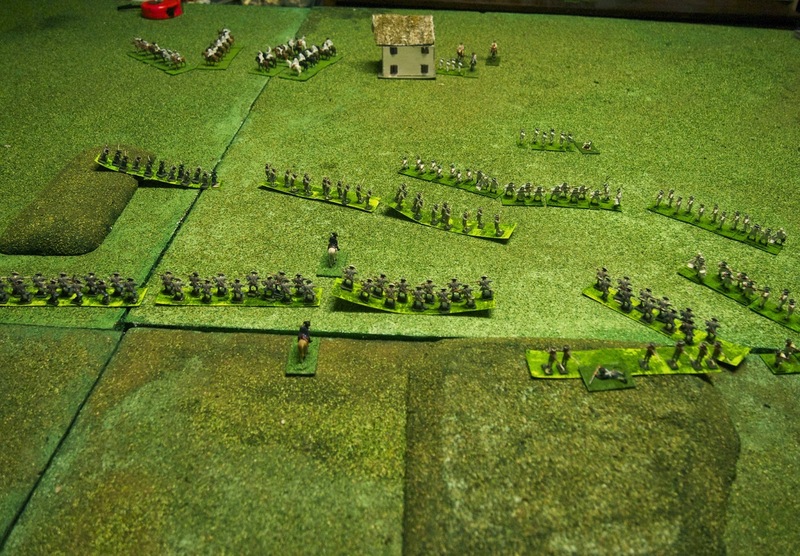 A close-up view of the same imminent engagement, with the French line about to be reinforced by their solitary battalion of grenadiers. 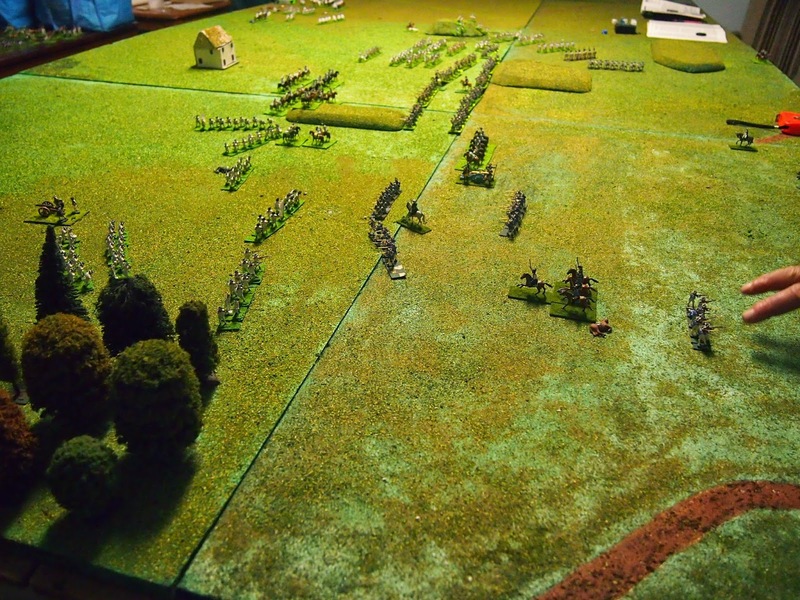 You can see that the French main line has already been outflanked at this point, and you can also pick out the heavy casualties that it has been suffering, its opponents also losing men in the extended (and very realistic) firefight. 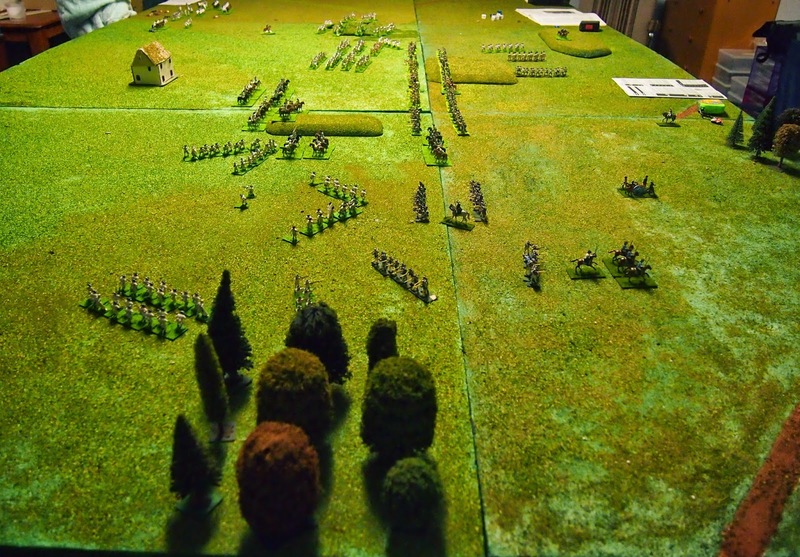 A beautiful shot of the view from the Austrian rear lines on the other wing of the battle, with the two fresh battalions still struggling to come up and the Austrian gun not doing anything very useful either. Ahead of them the battle is raging still, however, with the brave Bavarians now having shaken themselves out into an altogether more suitable battle line - and the cavalry melee, amazingly, still going on! 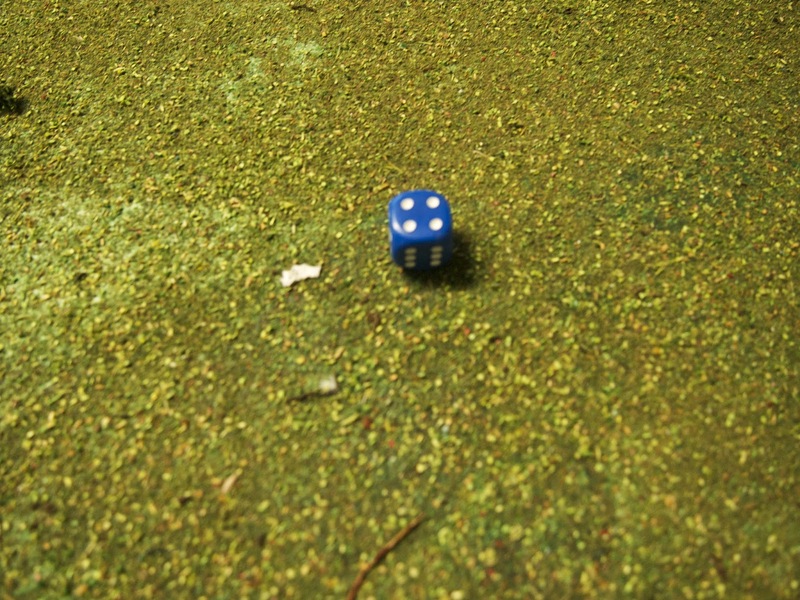 This was a very unlikely event in the rules and was caused by very particular die rolls. 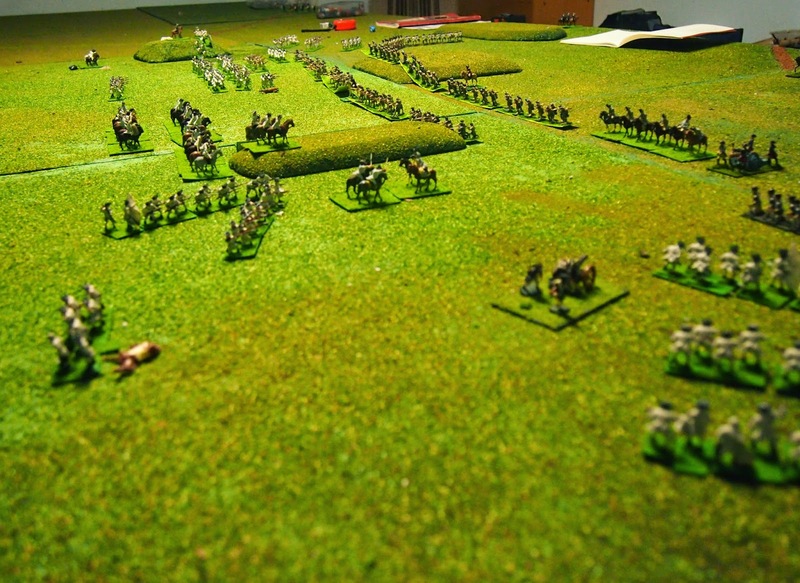 The Austrian cavalry in the centre, still almost completely unengaged, and holding back a considerable number of French infantry. 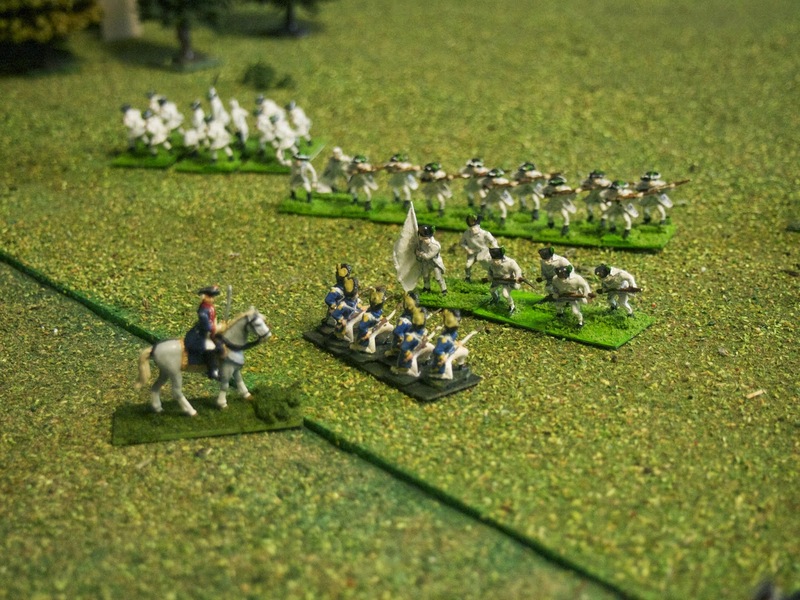 I felt very guilty at this point - had I been the French commander I would have advanced without fear, but the enemy held back, to my surprise and pleasure. 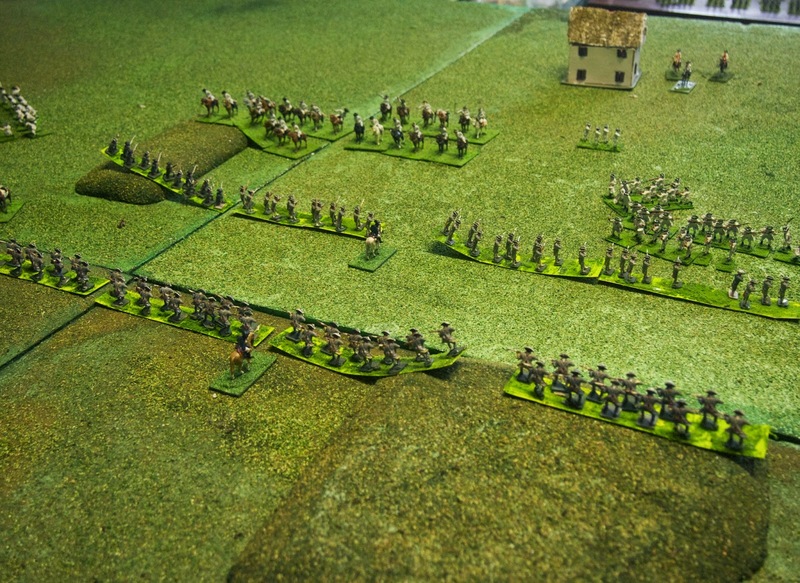 I have no doubt at all that this advantage will last me precisely one battle, this one - but just look at the French casualties on the right of their line. It can't hold up much longer! 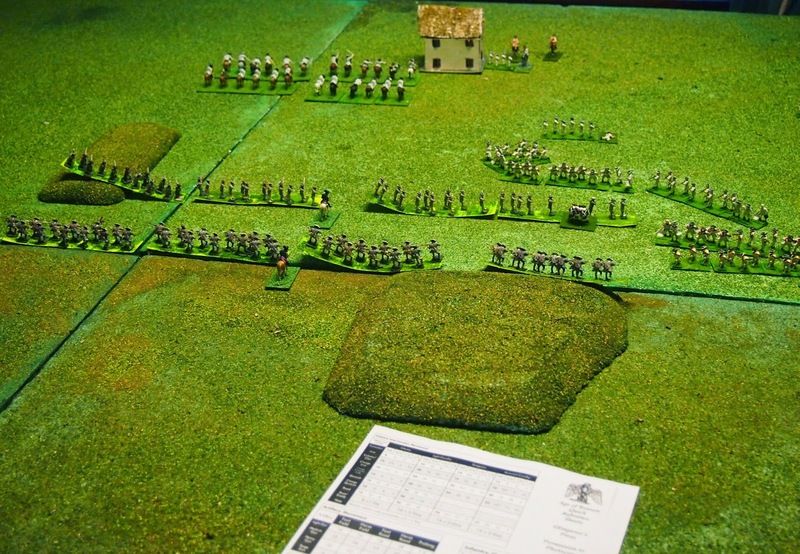 Back come the rejuvenated Bavarian cavalry, but an infantry battalion has had enough. It did look ominous for the Bavarian wing at this point, but as with all battles, things can change radically in a single move. But it was not to be. 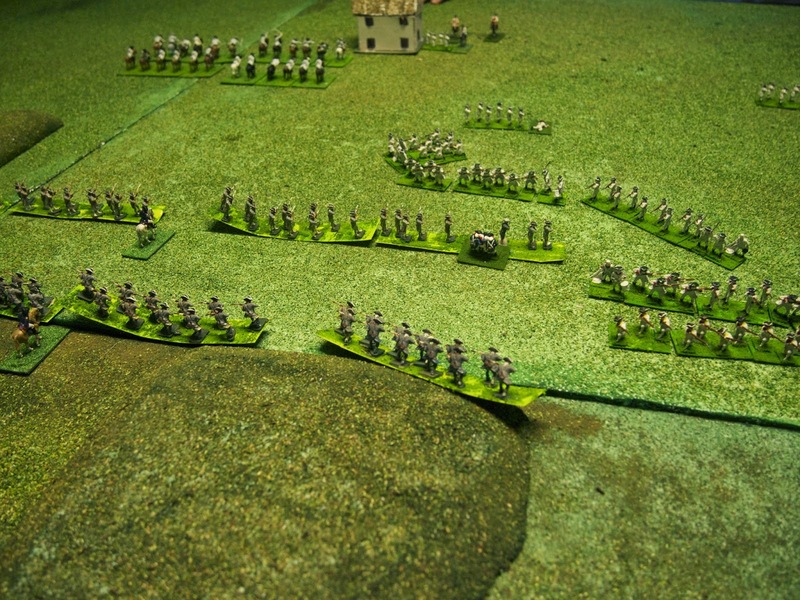 As the Bavarians started to collapse, with another battalion gone, the Austrian gun finally arrived on the scene together with the 'reserve' brigade. 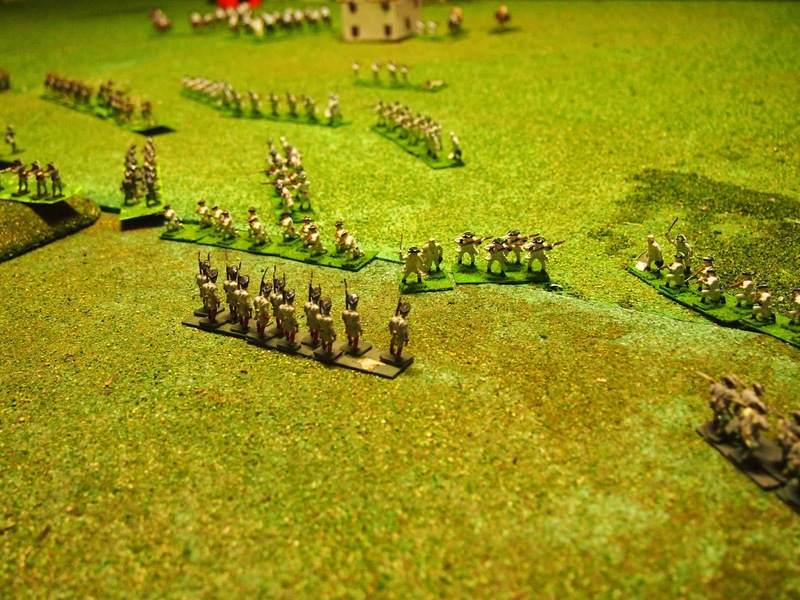 It was becoming extremely lonely for the Bavarian grenadiers, who had fought very gallantly all day. Off table in the distant left you can see the 'pile' of Austrian casualties - this was not a light action at all. 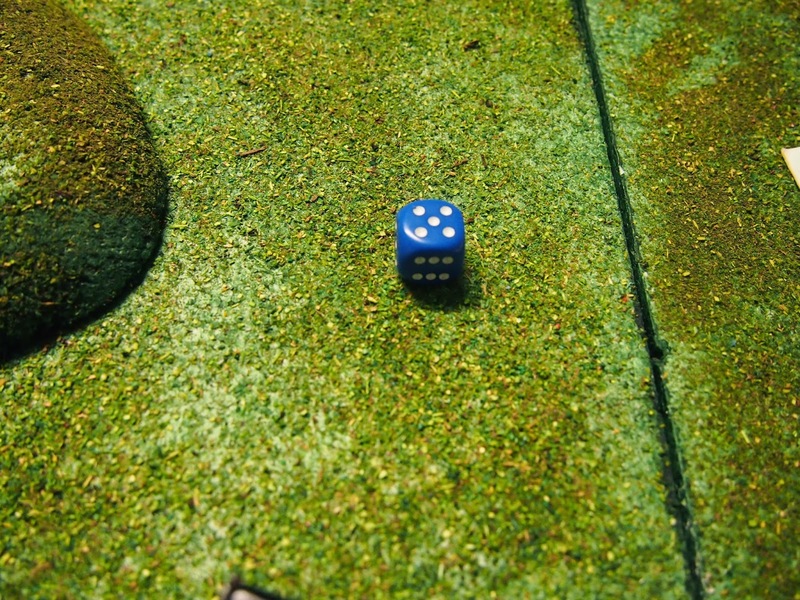 A devastating shot from the Bavarian artillery sent an Austrian battalion packing. 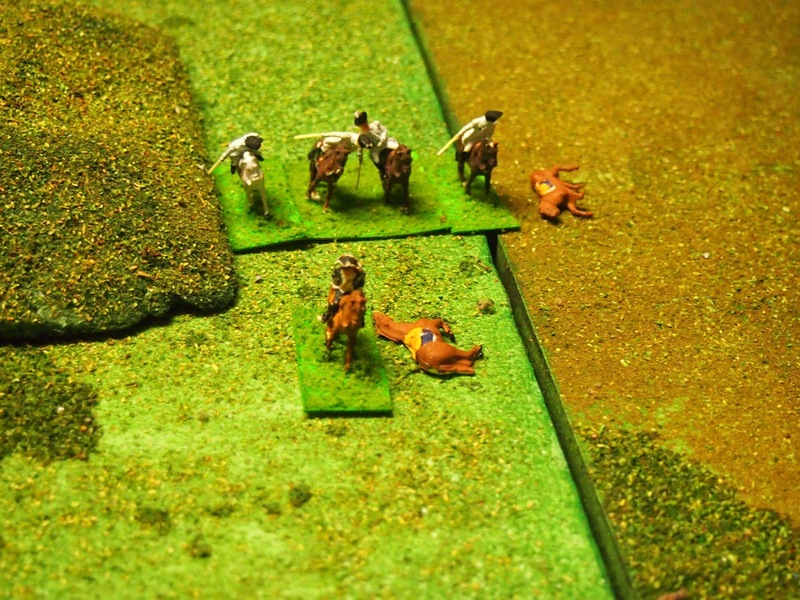 The cavalry melee continued, with heavy casualties. At last, the French in the centre began a general advance, but was it too late? ...as can be seen in this slightly more extended view toward the Austrian command HQ. On the French right, however, all was in chaos. 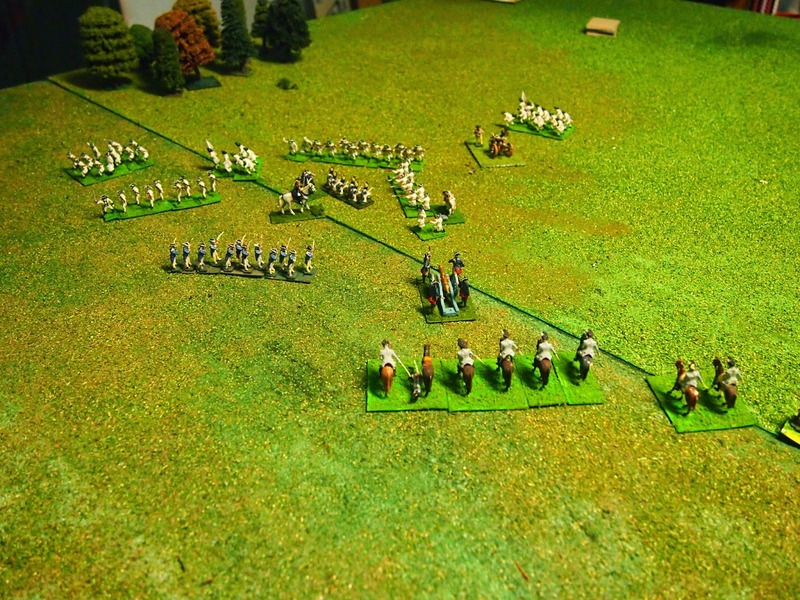 The grenadiers were falling back, one battalion remained, whilst the main line was suffering sufficient casualties to warrant a general retreat, although the Imperial forces were also retiring on the hill. Just how little remained of the French main line can be clearly seen in this view from French HQ. This was the breakthrough. On the left flank, predictably, the heroic Bavarian grenadiers were now being closely engaged by Imperial troops, with three more battalions in support. What would happen? What of course all this Austrian enthusiasm about 'breaking through' omitted to take into account was the fact, nicely brought out in this view, that the Franco-Bavarian forces still had a complete second line ready to step into the breach, behind which the CinC felt quite secure. 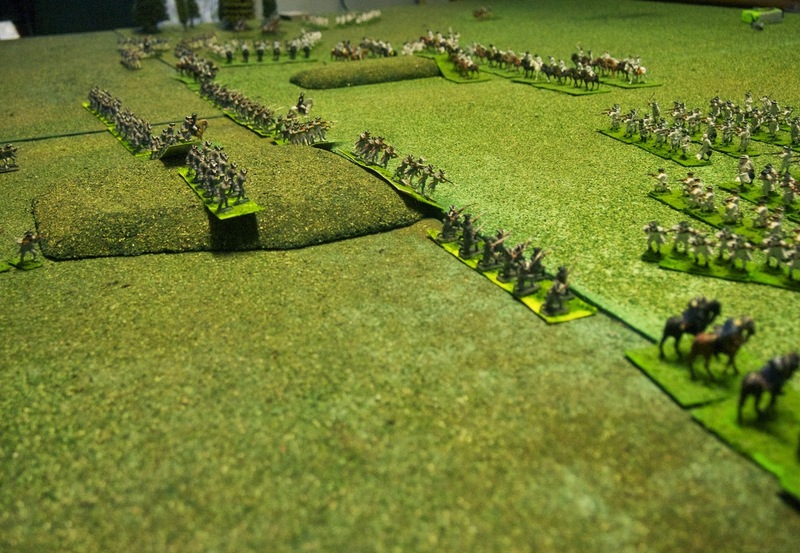 Another overall view of the battle on Move 7, showing the unengaged Austrian cavalry en masse and the double French line. Move 8, and the French right has fallen apart, with the Imperial forces now advancing across open terrain. The risk of outflanking for the French line is clear. A discussion now ensued between the French and Bavarian commanders with regard to the issuing of a general instruction to the army to withdraw in good order, before something worse should eventuate. The intactness of the French line except for the right wing is evident from the view below. 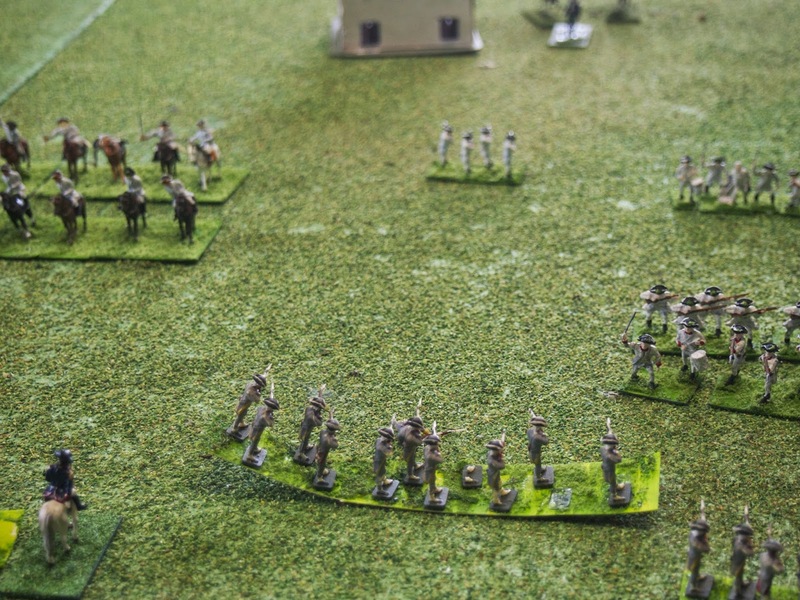 A close-up view of the battle on the left wing against the Bavarian grenadiers, who were still clinging on tenaciously despite appalling odds. The Bavarian commander urging them on can be clearly seen. French cavalry in retreat on the centre-left of the French position towards the end of the battle. To the left of the view can be seen the engagement with the Bavarians that was shown in close-up in the previous view. Looking at this view it is hard to see why the French could be considered to have lost the battle at all, as their line looks completely intact. 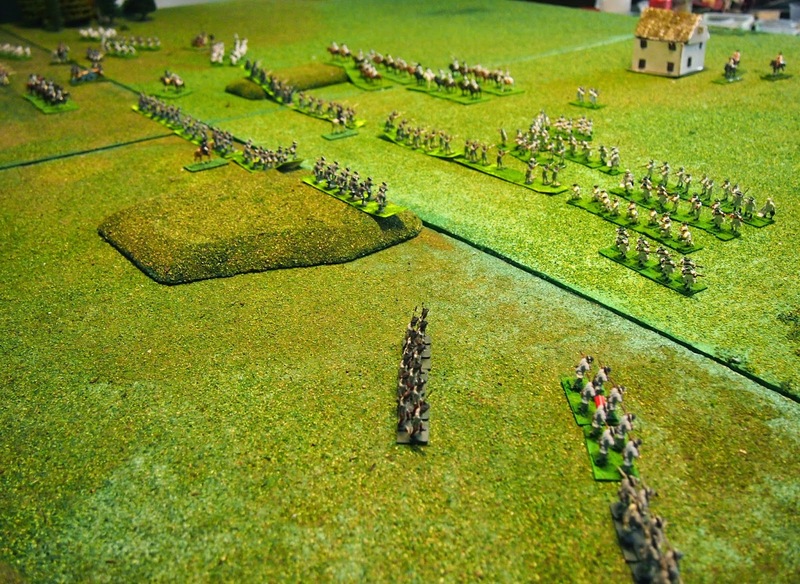 Move 9, the battle viewed from the extreme right of the French position, with two battalions facing what seemed to be a whole army. 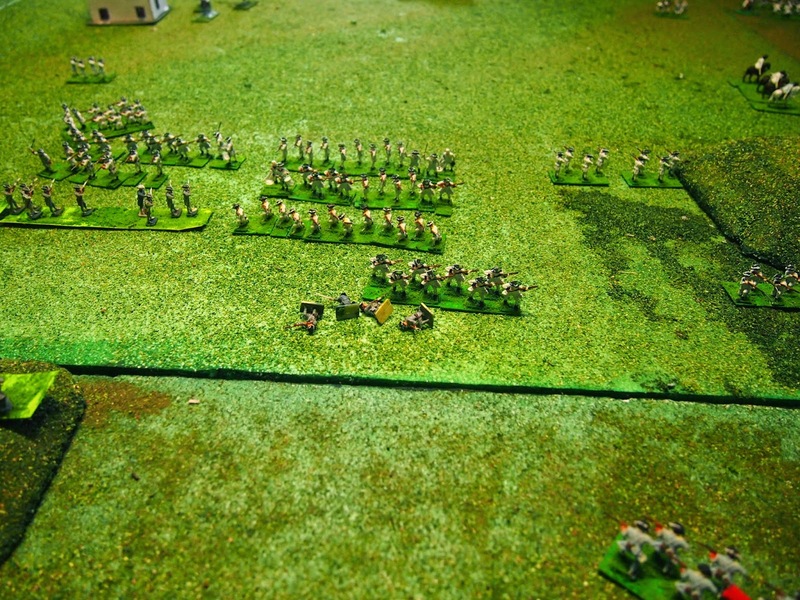 The nature of the outflanking risk to the French line can be seen from the view below. Nevertheless, the unengaged French infantry battalions can also be seen. One might think, in fact, looking at the battle from the standpoint of the Austrian CinC, that things had not really gone especially well. 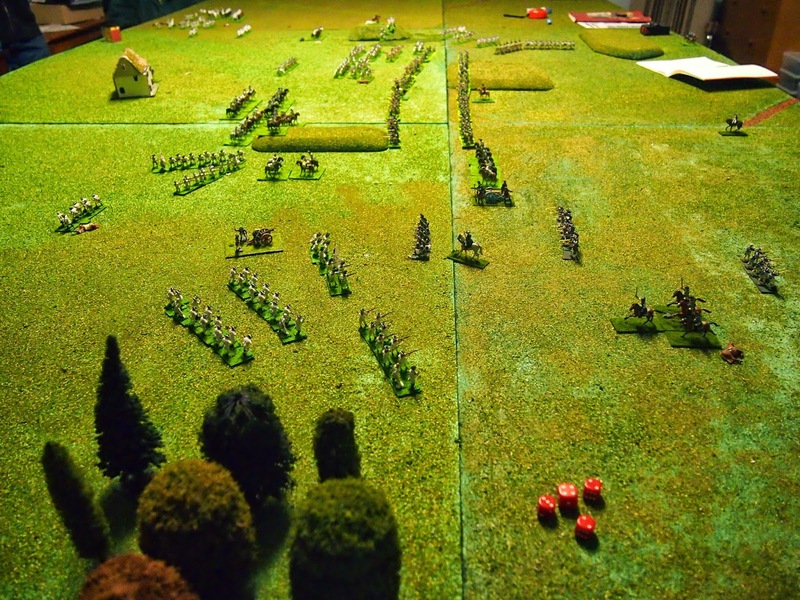 All he could see in front of him was a solid line of French infantry coming straight for him, with only 4 cavalry squadrons available to protect his HQ. But as artillery was manoeuvred into position to engage the Imperial forces on the left flank, with one battalion about to be enfiladed, and the final Bavarian line battalion also wheeled to support, would superior Imperial numbers on the left flank prove sufficient to win the day? 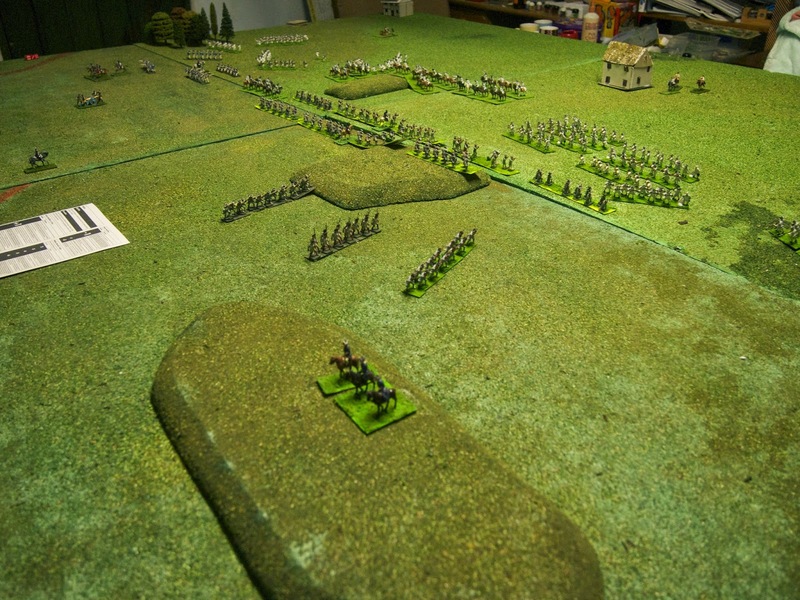 The 10th move, and French cavalry were retreating. ...and the Imperial cavalry began a large wheeling exercise preparatory to retiring for the night. It had all turned out badly for the Bavarians on the left flank. 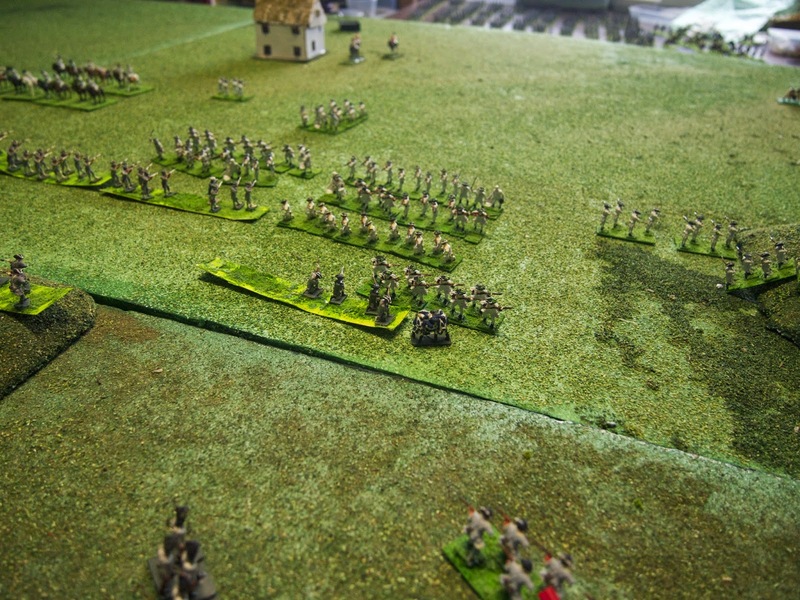 The grenadiers were in retreat and the artillery accompanied them. This left just one Bavarian battalion in action. But finally, the massed Imperial cavalry demonstrate and make ready for a fully-fledged charge against individual French battalions. One remaining French cavalry squadron looks exposed. As French battalions started to retire, the decision to order a general retirement was given. Surprisingly, although the second line was completely intact, and element of the main line was still there, French casualties had turned out very substantial. As evening fell a tactical victory was declared for the Allies. But this had been heavily dependent on the feint with the Imperial cavalry which was unlikely to be repeated. As we sat back to review the action, a wave of great satisfaction spread over us. 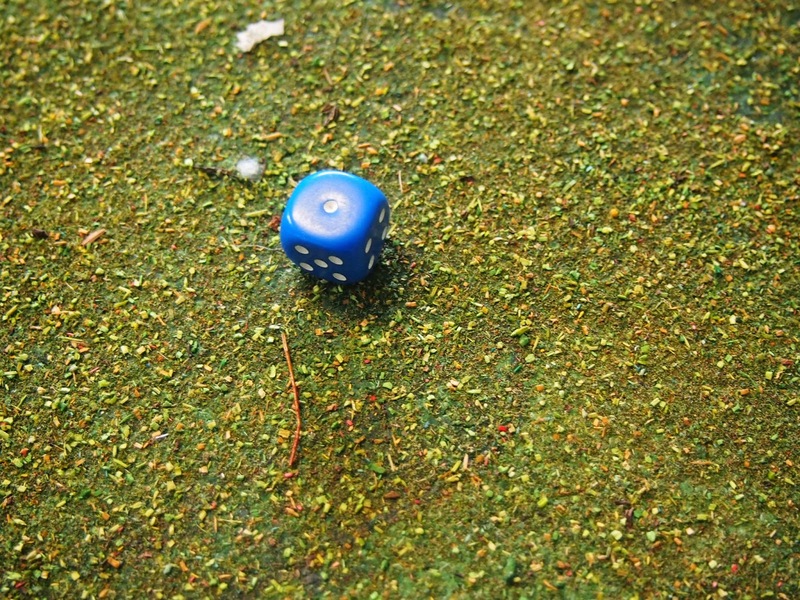 Win or lose, Age of Reason had passed the test. More than passed the test. 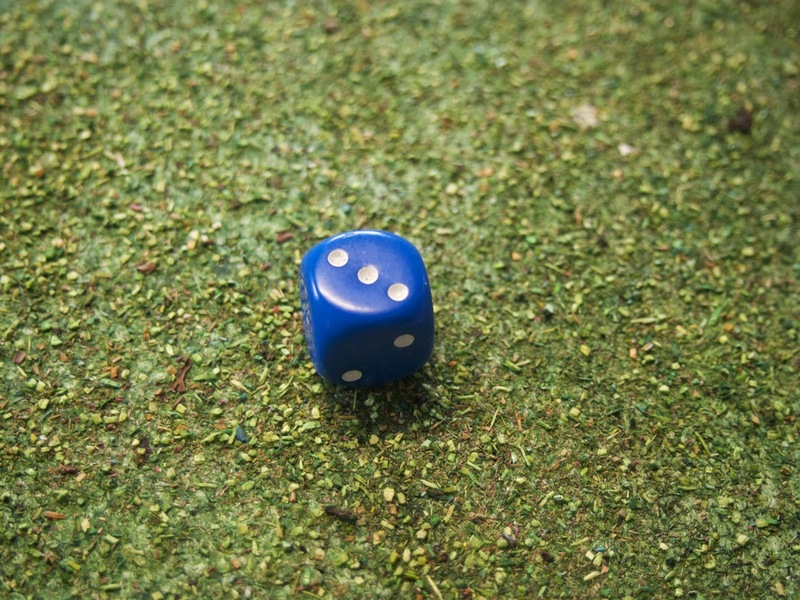 Nothing had happened that we thought unreasonable, and the rules had produced - on first use - an exciting and manageable action which completed in 11 moves with a decisive but not catastrophic result which we thought entirely realistic. AOR looked set immediately to become the Shako of the 18thC. All sorts of issues immediately flowed - any modifications we wanted to make to the 'trunk' of the rules, and any 'branch' modifications for War of Spanish Succession. 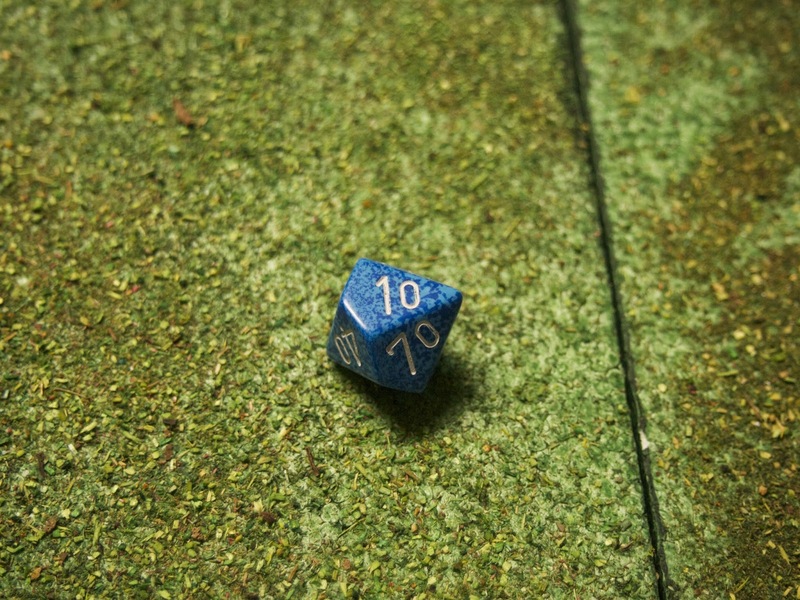 We are planning to playtest Beneath the Lily Banners next, but AOR has already set a high hurdle. Impressive scale - certainly looks more realistic than a lot of other games, mine included - with units facing each other inches apart. Looking forward to your Lily Banners game too. Thanks! The forces did advance to close contact with the lines blazing away at each other in a fairly plausible WSS sort of way. I can let out the secret that we did re-fight the battle using BLB - review to come out shortly - and we have definitely concluded we will stick with AOR, all of us being seriously impressed. Thanks for the interest, it really was a pleasure to see the differences between a WSS and a Napoleonic being brought to life after so many years. I'm the wicked architect of a fair few divergences from Napoleonics myself so will look with interest at your blog. I have a massive soft spot for science fiction games, but massive rebuilding of the WSS army is top priority this year. I'm glad they worked out for you. 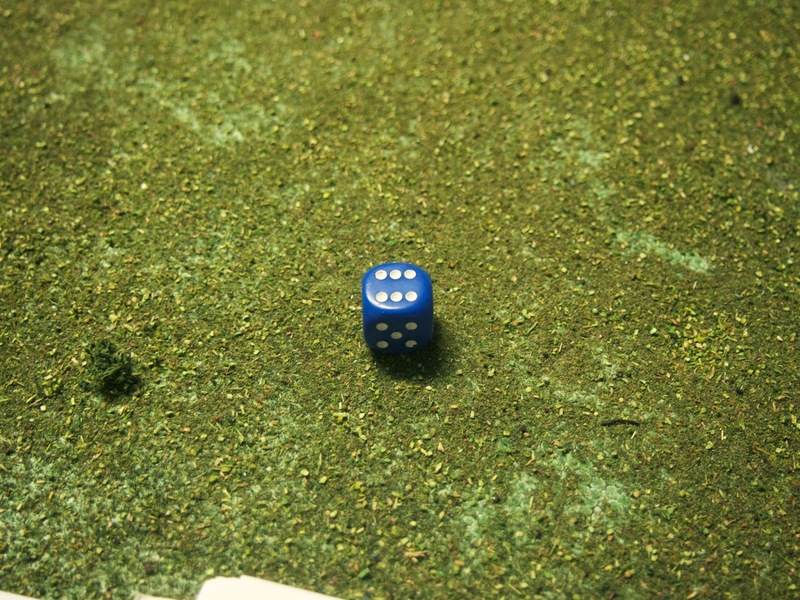 Impressive use of the dice too, although I thought it was initially your opening roll. I extensively used the Airfix British Grenadiers set for Napoleonic conversions, but never touched the Washington's Army set I had (and still have), although there were such possibilities (and some great poses). Who knows.what will become of them. Thanks for the comment on my first blog! We enjoyed using AOR greatly and we've decided to stick with them. 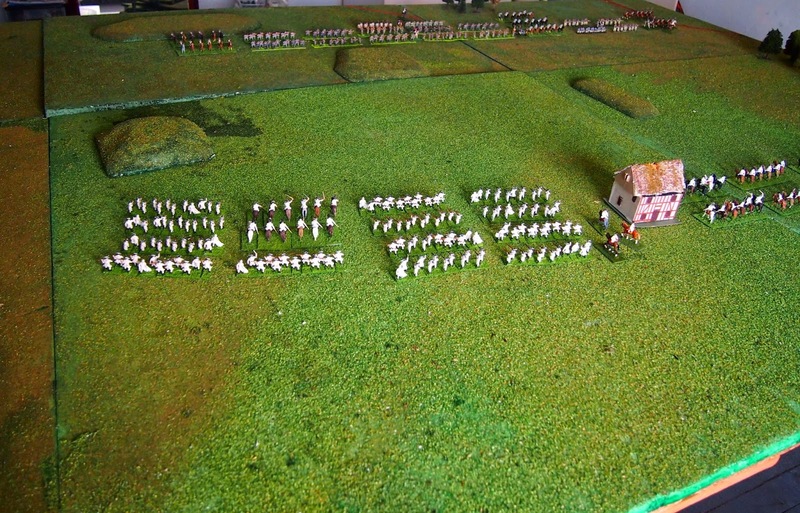 I'm always keen to acquire Washington's Army, and I well remember using the BG set as Imperial Guard back in the day - I suspect there were many of us who did...! BLB review to follow but as I have said above, we will stick with AOR.